The species in this family are very variable in their features. They can be vines or shrubs, but are usually trees. 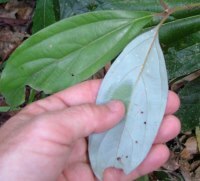 The leaves are usually simple, often discolorous, with a paler underside due to a waxy coating that can be rubbed off (pictured). The leaves usually have many small oil dots, but these are may only be detected with a magnifying glass. These oil dots provide some species with distinct aromas when crushed. The flush of new growth of leaves can be striking whites, pinks and reds, a contrast to the monotonous green of the surrounding rainforest. The flowers of many species in this family are often small and dull in colour. In contrast, the following fruits may be large and sometimes colourful. The most important and well known members of this family would be camphor and cinnamon from Asia, bay laurel from Europe, and avocado from the Americas. The original 'Bay Laurel' Laurus nobilis has been used as symbol by many civilizations, including for victory and honoured poets (and thus the term 'poet laureate'). The name 'Bachelor' for a study degree and meaning a single man came from the Latin for laurel berry (Perry 1977). Many species around the world were and remain important timber trees. This family has at least 50 genera and 3000 species (Hyland et al 1999), with many species found worldwide, but it is probably best represented in the rainforests of the Americas and Asia. 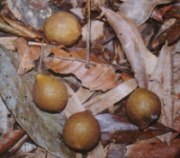 In Australian tropical rainforests, the family is represented by many species of what we commonly call 'native walnuts'. 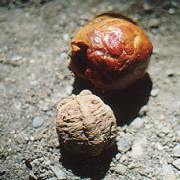 These have no relation to real walnuts, but are usually large fruits with a single solid seed surrounded by flesh, and a leathery smooth skin. These 'native walnuts' belong to several genera, such as Endiandra, Beilschmiedia and Cryptocarya. The family Lauraceae is also of interest here, because it is one of the so-called 'primitive flowering plant families' that are so talked about in regards to the Australian rainforests. This genus is comprised of a couple of hundred species found throughout the tropics of the world. The 'Yellow Walnut' is named for it's yellowish, brownish or greenish fruit, which is usually the size of a ping-pong ball, with a swelling at one end and a point at the other (pictured). The seed is distinctive, for it has two sharply pointed ends connected by a ridge. This plant is found only in the tropical rainforest of North-eastern Queensland. One of the best places to see them is in the driveway of Heritage Lodge towards Cape Tribulation. There are several hundred species in this genus, and they are found around the tropics of the world.